Police said carloads of people had come into the area from other parts of Sydney and committed violent acts. 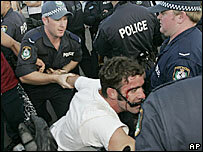 Australian Prime Minister John Howard condemned the weekend's attacks by thousands of young white men on people of Arabic and Mediterranean background. A reporter from the ABC national radio network said some of the people coming into Cronulla on Monday night had carried out attacks on property. Some of the violence appeared to have been carried out by youths of Middle Eastern appearance, raising speculation it was a retaliation for Sunday's unrest. "We have shops damaged at Caringbah, cars damaged at Cronulla," said a spokesman for New South Wales police. "We have six arrests at this stage." At the nearby suburb of Brighton-Le-Sands, "a smaller crowd has thrown bricks and other objects at police cars and passing motorists", the ABC reporter said. Earlier in the evening police had confiscated iron bars from parks and the roofs of buildings at nearby Maroubra. Police believed they had been stored there by residents. The ABC also reported police were monitoring cars travelling through the suburb of Rockdale, and large groups of people gathering in Punchbowl and Peakhurst. Thousands of young white men attacked people of Arabic and Mediterranean background on Cronulla Beach on Sunday. The fighting injured more than 30 people, including police officers, and at least 16 people were arrested. The clashes follow an assault on two lifeguards last week, reportedly by youths of Middle Eastern origin.